The New York Times published a fascinating article last week about the changing politics of physicians. The article reports that as more physicians abandon practices for salaried positions their politics have trended to the left. This trend is also present in the contribution patterns of health care professionals. 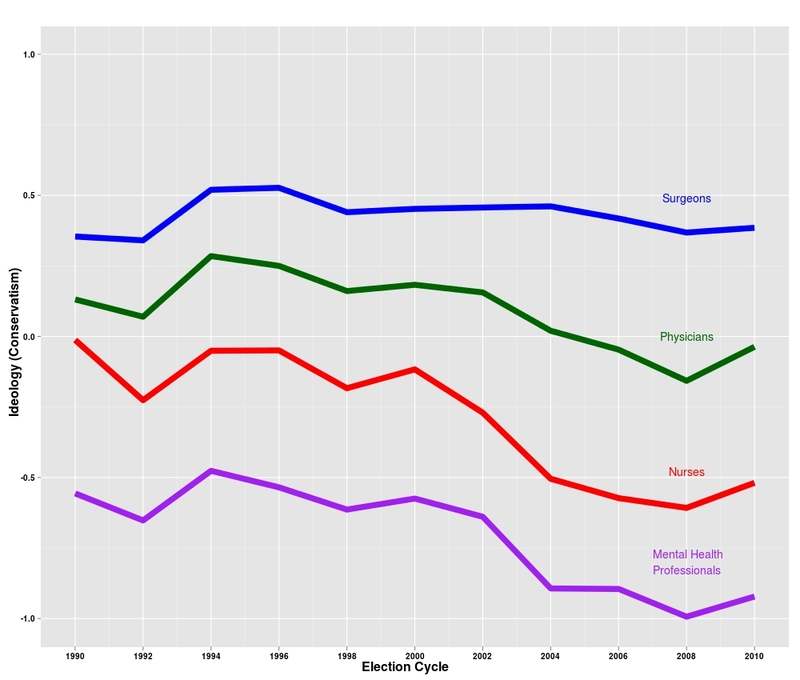 The figure below tracks the changes across time in the ideological giving patterns of four groups of health care professionals: surgeons, nurses, mental health care professionals (restricted to psychiatrists and clinical psychologists), and all other physicians. The trends track the mean ideological position (ideal point) of donors within each group. For each election cycle, I take the subset of donors from each group that gave at least once during that cycle and calculate their ideal points based on all donations made during that cycle and cycles prior. This permits the ideal point estimates to update with time. Here are some helpful summary statistics for interpreting the scale. The mean ideal point for the entire sample of 2.5 million individual contributors (which includes health care professionals) is -0.16. The mean ideal point is -0.66 for Democratic candidates and 0.82 for Republican candidates. Surgeons are by far the most conservative. They are also the group that was, on average, more conservative in 2010 than in 1990. The other three groups trend to the left in varying degrees. I included nurses to emphasize that the industry has been changing as a whole. I also included psychiatrists and clinical psychologists to emphasize that differences between groups is probably better understood as a function of self-selection into a given profession than anything else. Whatever differences in pay and work conditions exist between mental health professionals and other physicians, they would not be sufficient to explain the differences in ideology. That mental health professionals are significantly to the left of nurses reinforces this point. Ideological Giving Patterns of Health Care Professionals: The trends track the mean ideological position of donors from each group. The means are calculated from the subset of donors within each group who gave at least once during a given election cycle. Although revealing, the trend line for physicians leaves out much of the story. The mean ideological position is relatively stable, but there is plenty of action in the distribution. The 1994 and 2010 midterm election cycles represent the closest thing to electoral deja vu that we can expect to see in our lifetimes. This makes these cycles useful points for comparison. 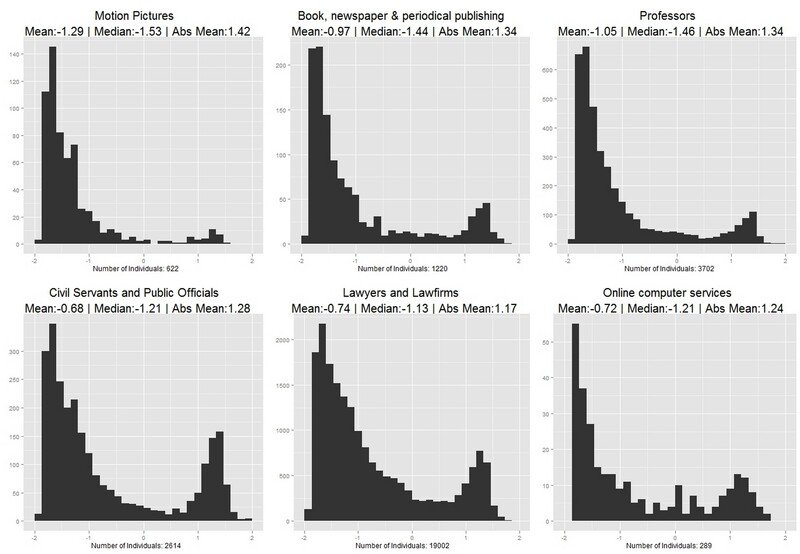 The figures below show the ideological distributions for surgeons and physicians in 1994 and 2010. 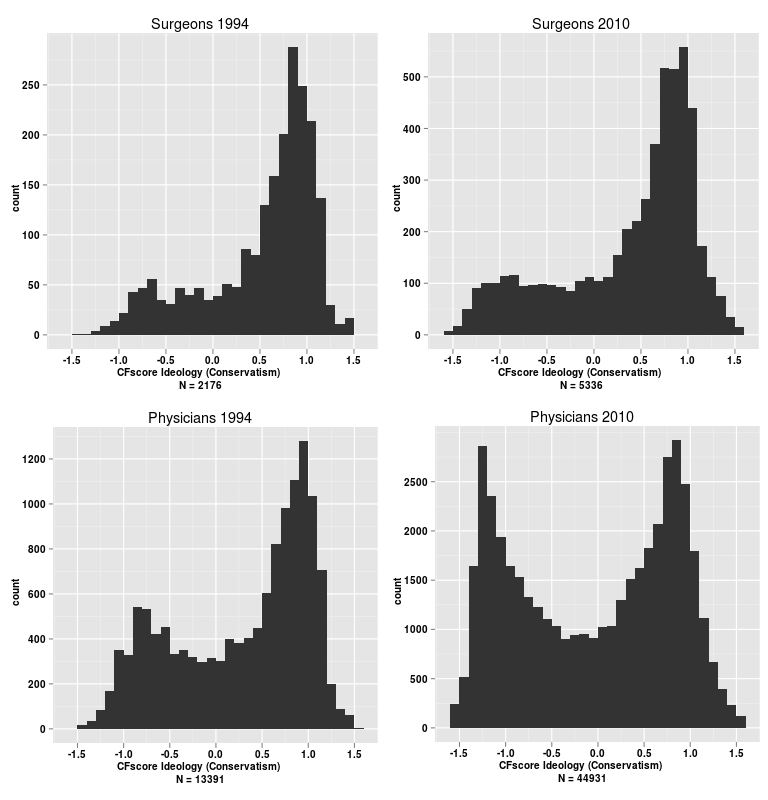 The distribution for surgeons fills out a little on the left over the years but remains unimodal. In contrast, the distribution for physicians changes quite a bit. Ideologically speaking, physicians have become more evenly divided and more polarized. I strongly suspect that Dr. Wilson is correct in his assessment. The link between doctors abandoning private practices for salaried jobs and their changing politics is probably overblown. I attempted to get at this question by dividing the sample into physicians who report being self-employed and physicians who report having an employer. I found only a slight difference between the groups. On the other hand, I sincerely doubt that the changes will be fleeting. The changes appear to be responding to generational shifts—in particular, the influx of women doctors. I was curious as to whether the rightward jump observed during the 2010 midterms resulted from 1) donors that had previously given to Democrats shifting their dollars to Republicans or 2) increased giving by Republican donors relative to Democratic donors. In other words, was it a case of changing minds or changing wallets? For each year, I categorize donors into one of six categories based on their giving patterns in previous cycles. Each bar displays aggregate amounts donated to each party. For example, the bar labeled “Strong Dem” in the 2010 panel shows that donors who in previous cycles gave 95% or more of their dollars to Democrats, gave $41 Million to Democrats and $1.5 million to Republicans. Partisan defections by Democratic donors had little to do with the 2010 shift in favor of Republicans. (In fact, the defection rate was greater for Republicans donors.) Increased giving by Republican donors and slightly reduced giving by Democratic donors account for the lion’s share of the swing. Republicans also received a larger proportion of dollars from first time donors than they had in the past. Republicans won 62 percent of the dollars from first donors in 2010, up from 44 percent in 2008 and 57 percent in 2006. Lastly, it is worth noting that the overall rightward shift during the 2010 midterms is no larger than what we saw in other industries. Hence, I caution against concluding that the shift was in direct response to the Affordable Health Care Act. I have been thinking lately about how the ideological distributions of individual contributors within certain industries might help illuminate the polarized state of U.S. politics. 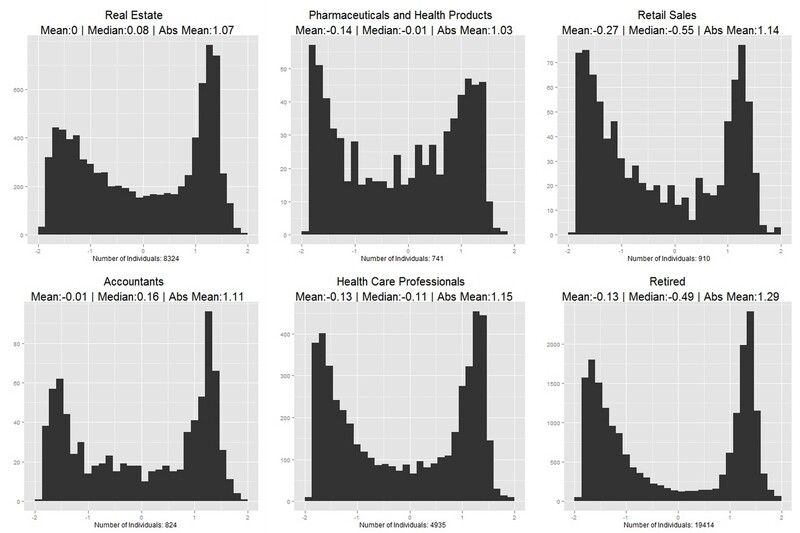 There are two types of distributions that could implicate an industry in abetting polarization. The first distribution is what political scientists would think of as typical of polarization, a bimodal distribution in which individual cluster at each extreme but very few locate in the center. The second is a unimodal distribution located at either extreme. Both distributions are characterized by a preference for extreme candidates over moderates, but the former indicates that members are ideologically divided while the later indicates that most members have similar ideological positions. This distinction is interesting because there is good reason to suspect that the ideologically aligned industries interact with the political system differently than their ideologically divided counterparts. 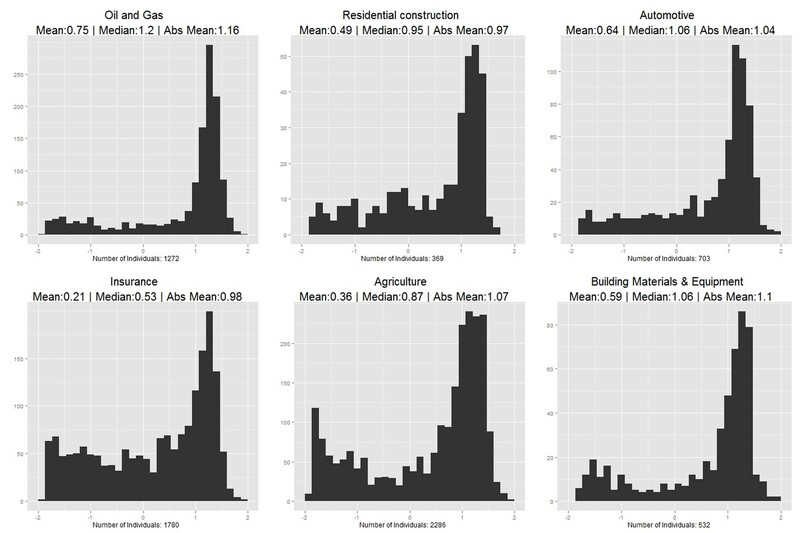 The figures above display the ideological distributions of industries that I refer to as ideologically aligned—that is, composed of members that are ideologically extreme but skew overwhelmingly to the left or right. Living up to frequent accusations by right-wing commentators, the unholy trio of Hollywood, the print media, and academia do indeed appear to be overrun by liberals, with lawyers and online computer services (e.g. Google) not far behind. On the other end of the spectrum, members of the oil and gas, construction, insurance, agricultural and automotive industries are overwhelmingly conservative. Although the ideological orientation of these industries is not much of a surprise, the extent to which these industries favor the extreme, rather than moderate, wings of each party far surpassed my expectations. Some of the distributions more closely resemble what I would expect from occupations that were subject to the spoils system–for instance, US postmasters prior to the Pendleton Act–than major contemporary industries with no official partisan ties. Granted, ideologically aligned occupations are not the norm. Most industries have enough members on each side of the spectrum to be distinctly bimodal. Some of these industries have distributions that lean heavily in one direction or the other, while others are more balanced. Health care professionals, real estate, investment bankers, and commercial bankers, each at the center of recent political battles over government intervention and reform, are perhaps the best examples of deeply but roughly evenly divided occupations. So what might we take away from this? Ansolabehere, De Figueriedo and Snyder (2003) have argued that the increasing proportion of campaign funds raised from individual contributors has helped safeguard our democracy by counteracting the influence of special interests and their PACs. This line of argument help push provisions in the Bipartisan Campaign Reform Act that froze the contribution limits for PACs at $5000 per election, while doubling the contribution limit for individuals to $2000 which was thereafter pegged to inflation. The existence of ideologically aligned industries brings pause to the notion that money raised from individuals is somehow less corrupting or less influential than money raised from PACs. Insofar as candidates are able to identify those industries vital to their fundraising efforts, why would the incentives to support policy that favors growth in those industries be all that different because the money came from individuals rather than PACs? Strangely enough, the comprehensive disclosure requirements for individual contributors may have had an effect opposite its intention. Rather than serving primarily to stymie backroom quid pro quid deals, it may have helped solved a coordination problem between legislators and aligned industries, by providing the means for those occupations to signal that enacting policy that favors their industry will fill their preferred party’s campaign coffers while only making a dent in the opposition’s coffers. This may seem less insidious than deals hashed out smoke-filled rooms, but as far as the public is concerned, the effects on policy probably are not all that different. Ideologically aligned industries might also fan the flames of polarization by encouraging politicians to write-off entire industries as their de-facto opposition. This could manifest itself in mostly harmless ways. For example Senator McCain can get away with dusting off his favorite (and only?) lawyer joke on late night talk shows and stump speeches, while a cash-strapped Democratic presidential hopeful would be better advised to stump against corn subsidies on public health grounds than deride lawyers or other professionals. Nevertheless, it could also rear its ugly head in policy disputes. Consider the ongoing fight over healthcare. Tort reform is one of the few clear opportunities for bipartisanship. Despite Republicans having oversold tort reform as a solution to keeping health care down costs, such reform would have at least had a marginal effect on costs and would have made the health reform bill much more attractive to the medical industry. (One recent survey found 92 percent of doctors in favor of malpractice reform, while 85 percent reported that the threat of malpractice lawsuits has prevented them from practicing medicine properly—it was commissioned by Jackson Health Care Services, so I would take the results with a grain of salt. A more direct estimate of the potential savings from health care tort reform can be found in the NYT’s Economix blog.) Yet Democratic lawmakers have continually dismissed tort reform with the flimsy explanation that medical malpractice is not a big deal because it only constitutes about 2-3 percent of medical costs. This is despite the notion that tort reform seems to be a natural complement to the White House’s early proposals to eliminate waste by freeing doctors to perform tests only when they deem them medically necessary rather resorting to “defensive medicine” to minimize legal liability. One question to ponder is whether ideologically aligned industries have contributed more to the pattern of polarization than ideologically divided industries. My initial thought on the matter is that ideologically aligned industries have help blaze a path for congressional polarization by supporting extreme candidates while other industries merely responded to the increasingly polarized candidate pool. Once I have a scaling that includes a time-trend of all election cycles going back to 1980, it should be possible to track how the ideological distributions industries have changed over time and examine whether some industries acted as a catalyst to polarization while others merely adjusted to it.